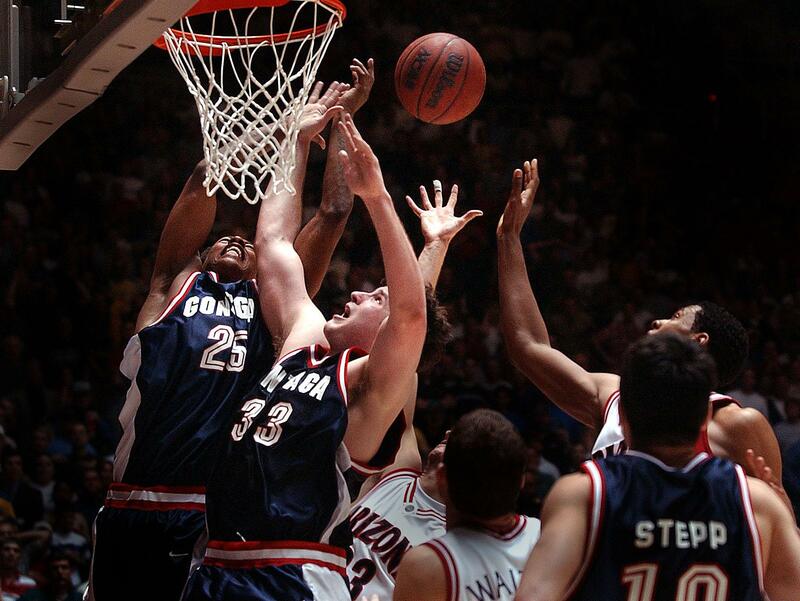 Sun., March 23, 2003, 8:02 a.m.
SALT LAKE CITY – To hell with it, let both teams advance. There was a lot of that kind of sentiment floating around Huntsman Center Saturday afternoon when the Gonzaga Bulldogs and Arizona Wildcats staged a college basketball game for the ages in the second round of the NCAA West Regional. But the NCAA doesn’t run its tournament that way. And in the end, after 50 minutes of the most inspired effort and riveting action any coach, player or fan could hope to witness, top-seeded and No.2-ranked Arizona shoved its way past ninth-seeded GU 96-95 in double overtime and sent the Bulldogs and their breathless fans packing. The wonderfully entertaining affair ended in fitting fashion, with both teams scrambling for possession in the final second after Gonzaga’s Blake Stepp missed a leaning 7-foot jumper that would have given the Bulldogs the biggest upset of this year’s tournament. Instead, the Pacific-10 Conference champion Wildcats (27-3) advance to the next round of West Regional play in Anaheim, Calif., where they will face Notre Dame in the Sweet 16 on Thursday. And they do so knowing they could have easily been the team writhing on the floor in disappointment after Saturday’s scare. “It’s the greatest game I’ve ever played in,” said Arizona senior Rick Anderson, who finished with 17 points and 11 rebounds. “Everybody on that floor wanted to win, I could see it in their eyes. We got lucky in the end and come out victorious. “I think it was one of the best games of all times – definitely an ESPN Classic,” echoed teammate Jason Gardner, who matched Channing Frye’s team-high 22 points for UA. Well, for openers, there was Stepp’s final shot, which was released with 4 seconds left in the second overtime. After faking Arizona’s Salim Stoudamire up in the air, he leaned in and banked his short jumper too high on the backboard and off the front of the rim, setting off a mad scramble for the basketball that was won by the Wildcats’ Luke Walton just as the final buzzer sounded. “It was a pretty good shot – 6 or 7 feet,” said Stepp, who, along with Tony Skinner, scored 25 points for the Bulldogs (24-9). “But your emotions are going, you have a shot to win the game and I shot it a little long. Maybe I shouldn’t have used the glass, because the rims are so tight here. No, Skinner was long with an uncontested 3-point try about 2 seconds earlier. And then there were the two shots the Bulldogs had with just under 2 minutes left – one by Richard Fox and another by Skinner - neither of which drew iron, resulting in a shot-clock violation and a GU turnover. Actually, there was at least one. And it was Skinner who took advantage of it by leaping over the back of two Arizona players to tip in Stepp’s last-second miss and tie the game at the end of regulation. When it finally ended, 10 intense and exhausting overtime minutes later, players from both teams dropped to the floor in an attempt to catch their collective breath and deal with a wild array of emotions. “Adrenaline stopped flowing, and everybody realized how exhausted they were,” explained Arizona coach Lute Olson, who went on to heap praise on Gonzaga, which finished the game with starters Ronny Turiaf and Winston Brooks watching from the bench with five fouls. “They’re as good as any 1 or 2 seed around,” he said. “They have huge hearts. Down the stretch, it seemed we would get off on them a little bit, and all of a sudden, big shots, big follow-ups. GU’s Mark Few, amid the postgame tears and heartache in his own locker room, agreed. “There probably shouldn’t be a loser,” he said. “I think we should both advance, but that’s not how it works. We certainly don’t have any regrets, because we left everything out there. The game was physical and tightly contested from the start. GU led 44-41 at halftime, but Arizona - behind the passing of Walton, who finished with 16 points and a game-high nine assists - scored the first six points coming out of intermission. The Cats eventually went up by eight, 65-57, before Stepp shot the Bulldogs back into it with a pair of 3-pointers, one of which he turned into a four-point play. The Bulldogs’ chances seemed to dim considerably with 2:16 left in regulation. That’s when Turiaf, who had contributed 16 points, five rebounds and a solid defensive effort on Frye, picked up his fifth foul trying to take a charge. After that, GU had no big men capable of staying with Frye, the Wildcats’ talented sophomore center, who scored five of his points and seemed to get a hand on every big rebound the rest of the way. The loss brought an end to the careers of Bulldogs seniors Zach Gourde and Brooks, who were both on the bench when the game ended. Brooks fouled out with just over 2 minutes remaining in the first overtime after scoring five points and grabbing six rebounds. Gourde, who played only 13 minutes, finished with two points and three rebounds. Published: March 23, 2003, 8:02 a.m.